After our initial jumps of joy and jubilation, followed by the throngs of fellow trekkers in line for the primo photo op, a tasteless mint tea, and hugs abound, we set off for the long, knee-aching hike down. Unfortunately I was so focused on making it to the top of the pass that I kind-of forgot we had a very long way left to go. Probably the worst part of the hike remained: Six more, grueling hours descending 6,000 feet until we would be done for the day. 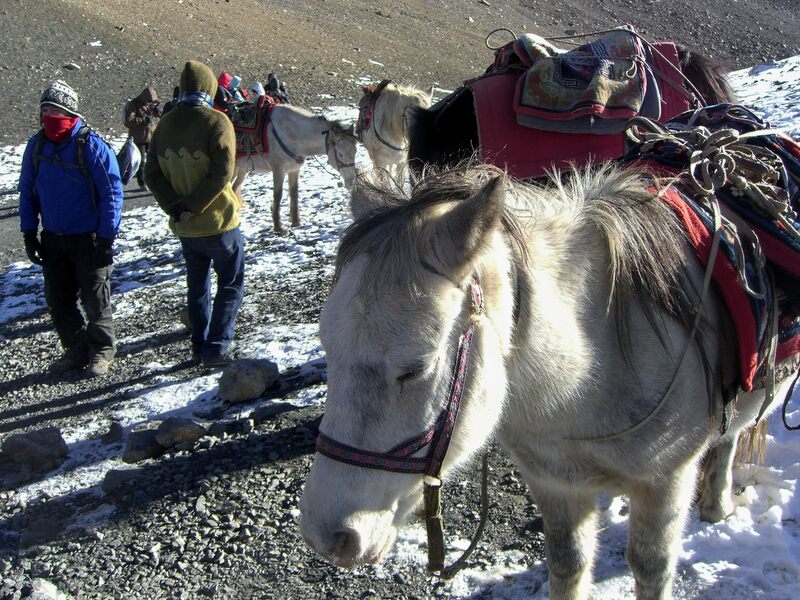 Even the mules were tired. The trek down was surprisingly dangerous. It was very slippery, loaded with ice and plenty of loose rocks along the steep path. My knees killed with a sharp excruciating pain during each, careful step down. The craziest thing of all is that we were soon passed by a couple of Belgium guys on mountain bikes! It was extraordinarily dangerous and shocking that it was even permitted. There were points on the trail when the bikers had to get off and walk their bikes down because it was so steep. Perhaps what was even more surprising was the fact that they had to carry their heavy bikes all the way up to the pass on their backs, at such high altitude. At least the ride down was easy despite the danger involved to themselves and other trekkers (there were a few close calls). The landscape turned barren, bleak and brown. There was no vegetation in sight. 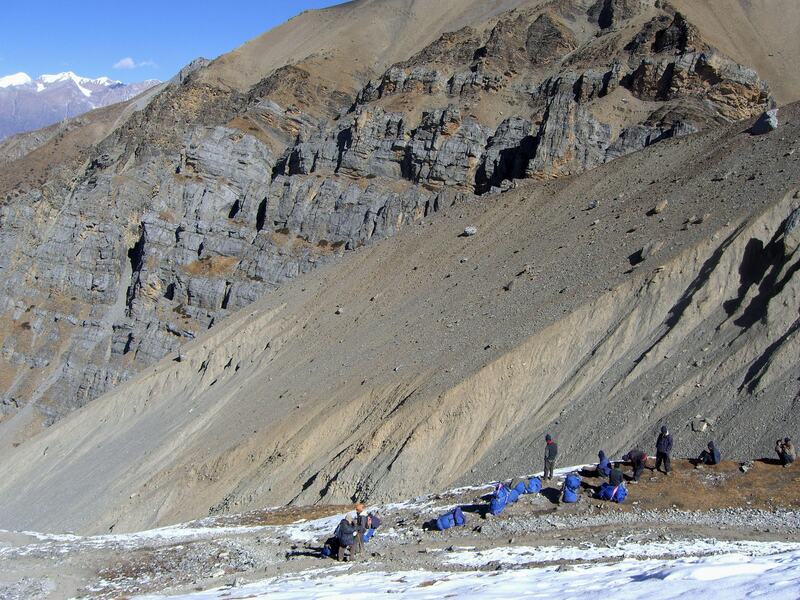 It was the closest point along the trek to Tibet and I felt like we were on another planet. 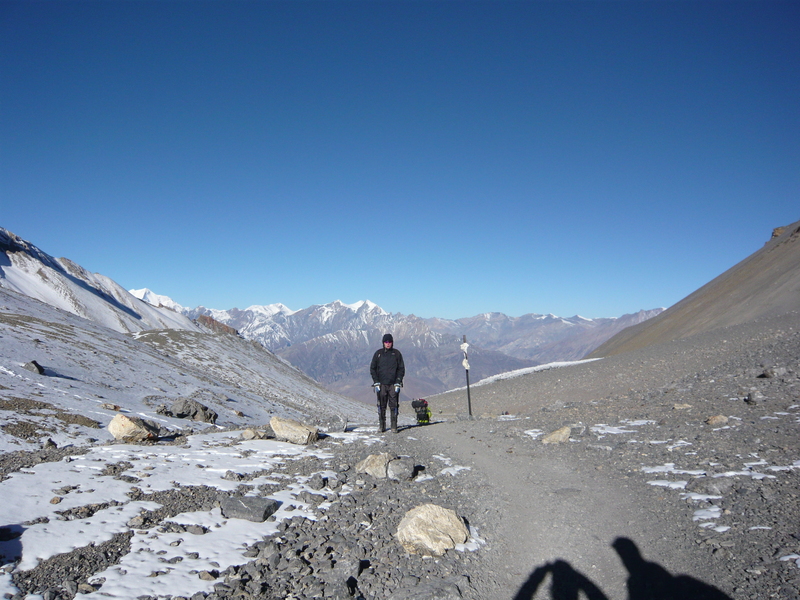 Yet despite the starkness, the landscape was beautiful and serene. The foothills and slopes of the brown mountain landscape looked like freshly whipped butter. The folds went on and on into the vast emptiness of the land. 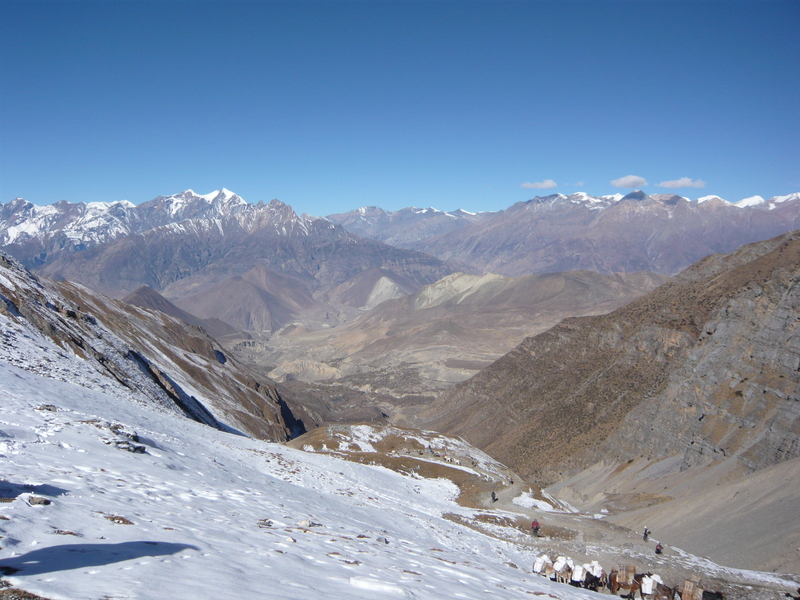 The pass was now far behind us and in the distance, the snow-capped peaks of the mountains juxtaposed nicely against the dirty brown landscape. We walked down, and down, and down, dragging our feet while conversation flowing steady but slow. There were no teahouses along the way for a tea break or snack. Nothing but the land. The familiar “Are we there yet” questions began to creep back out of my mouth, even though I didn’t want to be the wimp. My 68-year-old father pressed ahead, continually amazing me and Hari alike. I followed painfully as the third and Chrring with the two thirty-pound backpacks and as always a smile, was at the end of our group. I felt bad even thinking about being tired and “struggling” with the hike. 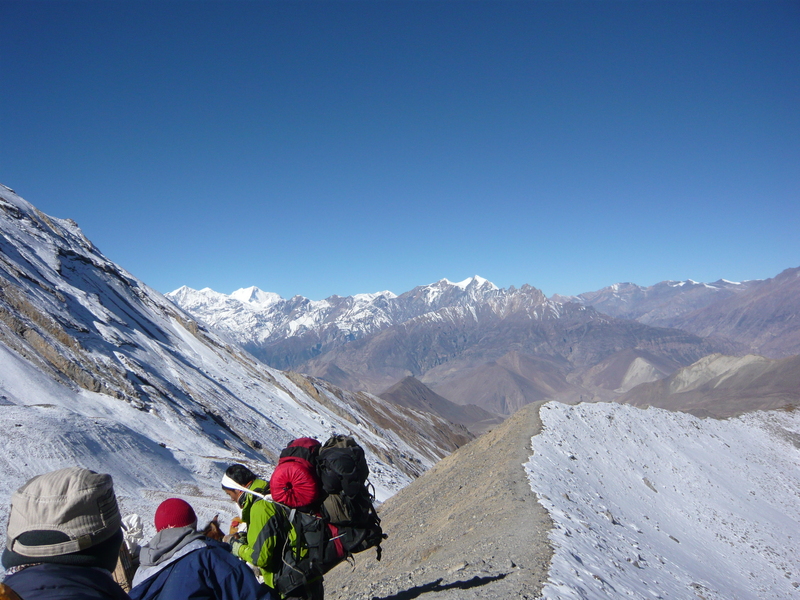 For this is a way of life for most Nepalese. They didn’t have the latest gear: The REI brand, heavy-duty hiking boots, the fleece jackets, sunscreen, trekking poles, and serious backpacks. No they didn’t have any of these “luxury” items which are a trekker’s standard. Instead, they hiked uncomplaining in worn-out sneakers, torn pants, old coats, no sunglasses, and sometimes even flip-flops. The guilt crept in my head and made me feel ashamed. Ashamed of my complaining and sad that our lives had so many material comforts that are unknown to most of the world. Life isn’t fair, that is for sure. Finally, like an oasis in the dessert, the tiny, brown formation of a village appeared within the distance. It was still an hour away but at least we finally saw it and knew it was real. 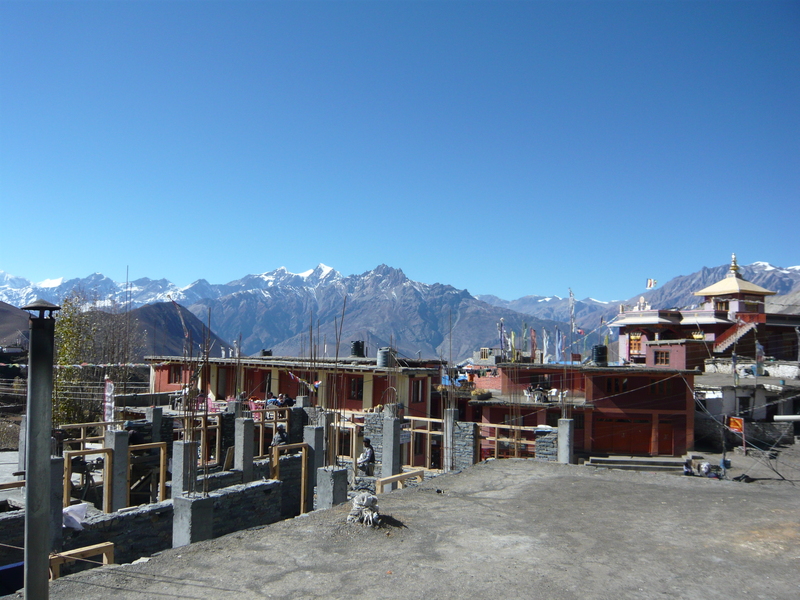 The village of Muktinath awaited us and it was only at 11,512 feet! We could barely walk when we arrived. Utterly exhausted. Thankfully, we FINALLY had a hotel with a hot shower, yet it was still outside our room. It was the first hot shower we’d had since leaving Kathmandu. Plus there was an unexpected surprise….the long-forgotten western toilet was in our room! No more walking to the communal holes at two am. I was overjoyed at these small plumbing luxuries that we always take for granted at home. The day was spent relaxing in the bright, warm sun on the rooftop deck of our teahouse. Happy hour was more joyous than usual since we were at a lower altitude where it was a little safer to drink and we were celebrating. 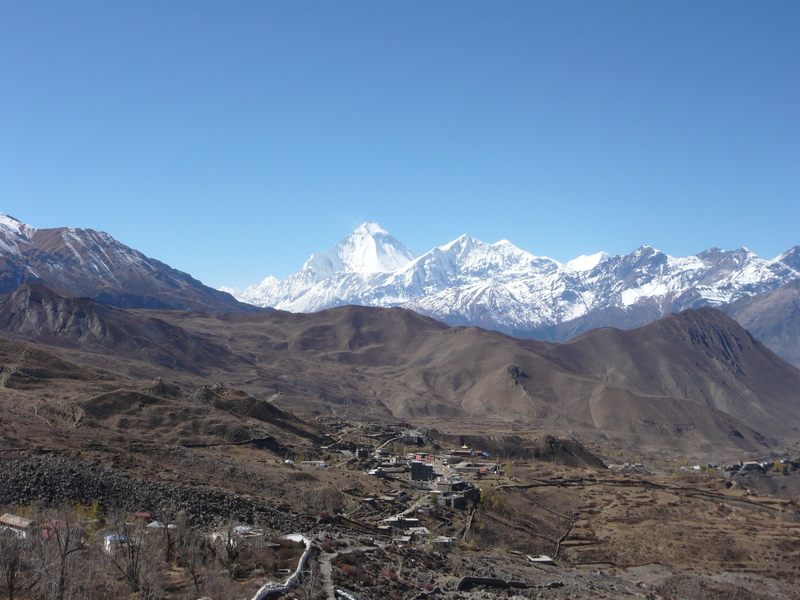 We only had one day left of hiking and then we would be off to Pokhara, the real reward of the trek. 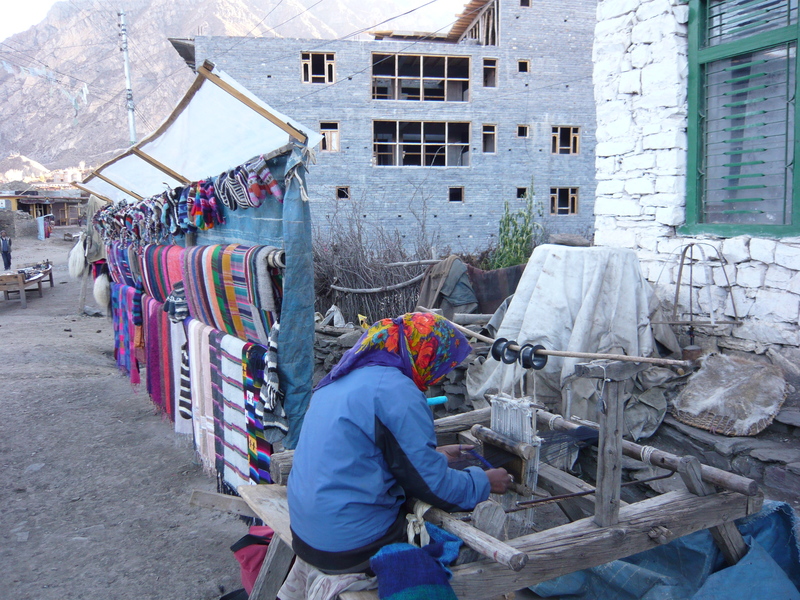 There was nice local shopping in Muktinath. The next morning before setting out on our final walk, we did a little shopping and I negotiated a new hand-woven, wool scarf for the “morning price” of $2.00. Wow. I still wear it happily today. Here are some pictures along the way. Off in the distance, the village awaits…at last! I love your lines: “The foothills and slopes of the brown mountain landscape looked like freshly whipped butter. The folds went on and on into the vast emptiness of the land.” Very poetic.